Is New Zealand Prime Minister Jacinda Ardern Promoting Islam? – Coercion Code – "Dark Times are upon us"
Readers who were justifiably suspicious of content in a meme generated by a partisan source asked us whether its statements were true, and they were. Ardern garnered praise for guiding her country through grief in the wake of a mass shooting that claimed the lives of 50 people at two mosques on 15 March 2019 while Brenton Tarrant, a 28-year-old Australian suspected of being a white supremacist, was charged in the slayings. NZ Prime Minister @jacindaardern is a remarkable leader. Here, she addresses mourners after the #Christchurch terrorist attack. Even Friday’s call to prayers for Muslims in New Zealand will be broadcast nationally on TV and radio, and there will be a two minute silence on Friday, Prime Minister Jacinda Ardern announced. Ms Ardern said the Friday call to prayer will be broadcast in a show of solidarity. On Wednesday she also announced two minutes of silence will take place to mark a week since the attack. Intriguingly there are around 45000 Muslims in New Zealand, just 1% of the population. This is a just tiny fraction of the 4.5 Million citizens, yet PM Arden brings a new level of acceptance and respectability to Islam in the wake of the killings. Cardinal Dew will go to the local mosque (Kilbirnie) as well on Friday to stand outside during their prayers as an act of solidarity. The Catholic bishops here have been very sympathetic and playing out their “inter-faith role” with great enthusiasm. 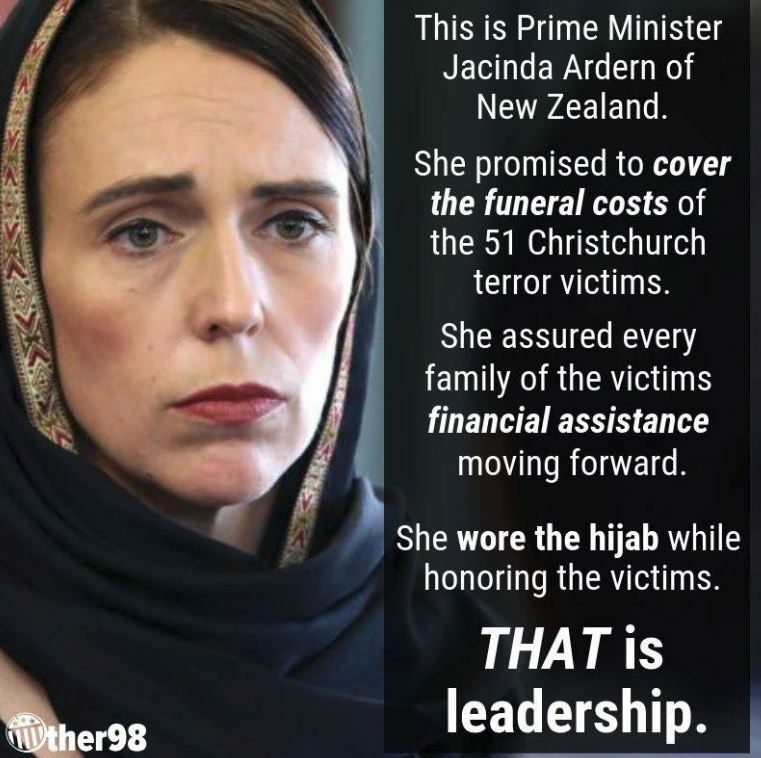 Although many would appreciate her compassion and care, the question is still, is Prime Minister Ardern quietly promoting the acceptance of Islam, or should all leaders be taking a leaf from her book? Previous Previous post: Shocking: NZ Police Tactical Team in Training Session When Mosque Shooting Began!